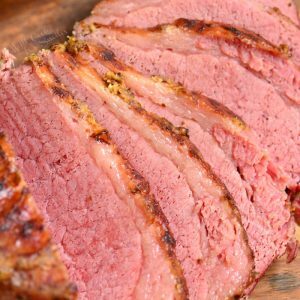 Soft, juicy, and tender corned beef brisket made in an Instant Pot and finished with spicy mustard under the broiler. 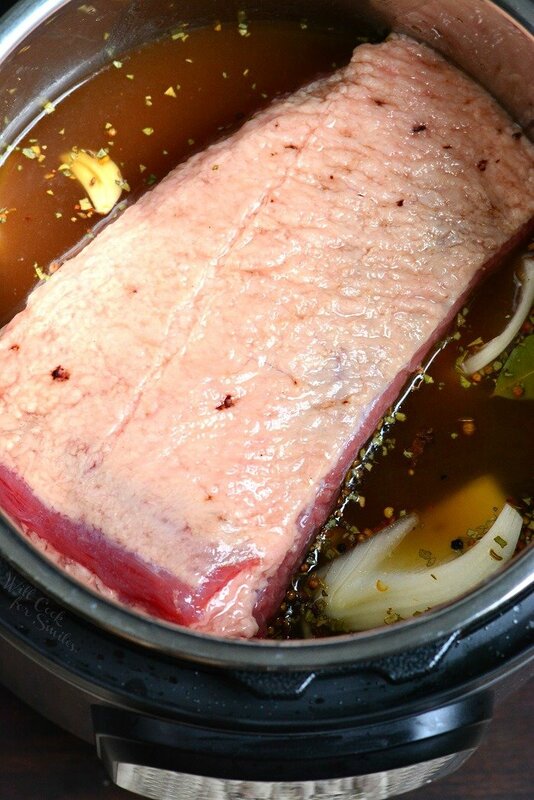 Making corned beef brisket in an Instant Pot is so easy and only takes about an hour and a half. This corned beef is so tender, it falls apart in your hands. You can eat it all by itself, serve it with any sides, or make sandwiches with it. 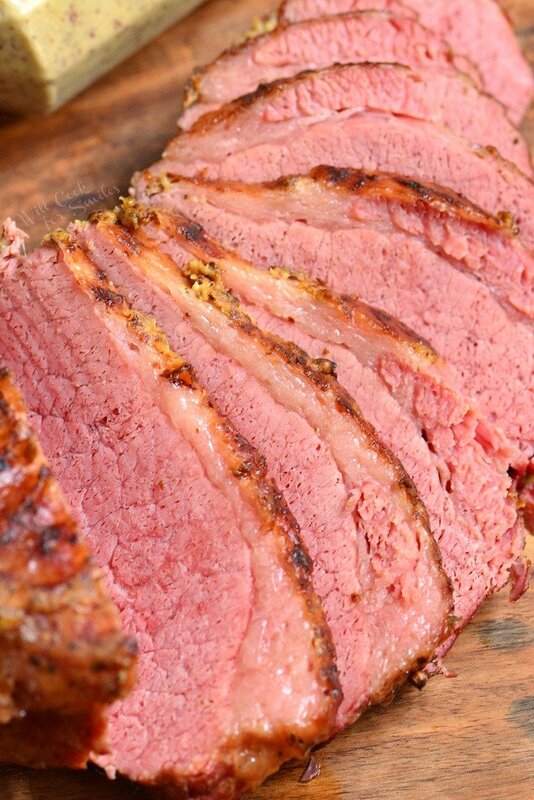 We love corned beef brisket here and make it much more often than once a year for the holiday. 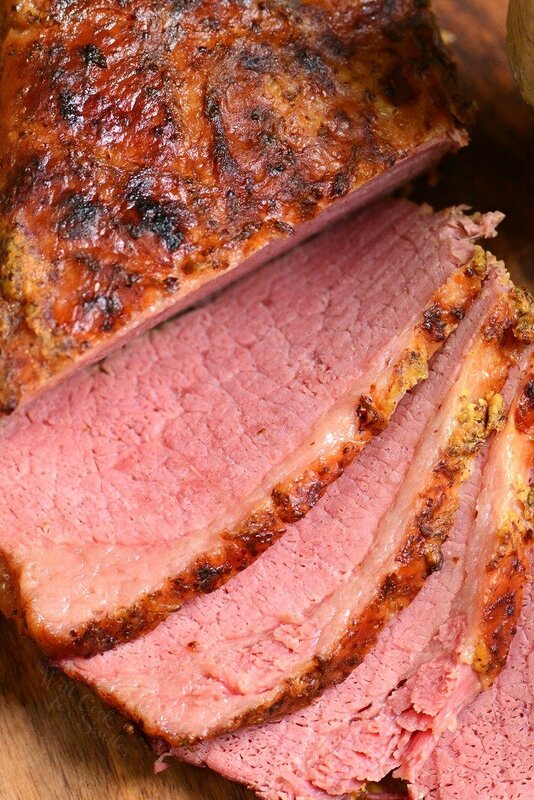 If you enjoy it just as much, try our simple 4-ingredient oven baked corned beef brisket. You won’t be disappointed. We just love brisket and corned beef brisket at our house. Most of the time, our brisket doesn’t even make it to dinner time. Right after I slice it, my husband and I just stand at the kitchen counter and eat it. Corned beef is made to pack a lot of flavor through brine already and then, it’s also cooked with a delicious combination of spices that adds even more flavor to the meat. If that’s not enough, I like to finish it off under broiler to get some caramelization on top. When I first got my Instant Pot, my goal was to try all of our favorite recipes and meats in an Instant Pot to see the difference in textures and flavors. Pressure cooker is great for saving time on the recipes that take a long time. It’s also great for achieving great tenderness in meats. Corned beef brisket was one of the first meats I made in my Instant Pot and let me tell you, the results were unbelievable. I knew that meat was going to achieve the tenderness that it should, but wow. The texture on this corned beef is just perfection and so much better than I expected. Every time my husband takes a bite, he is in disbelieve that such tenderness is achieved in just an hour and a half. He says that it should be cooked for hours to be this tender. Corned beef is simply a beef that has been cured in salty brine for many days. Curing the beef was originally done to preserve it. The term “corned beef” is synonymous to “pickled beef” because the brine used for corned beef is similar to the pickle brine. Traditionally, corned beef is made with a brisket cut. Since it’s a tough cut of meat, it’s meat to be cooked for an extended period of time to make it tender. Sometimes, beef round or rump is used instead of brisket. You can make your own corned beef by curing a brisket in salty brine in the refrigerator for about 10 days. After it’s been cured, cook it with additional spices, beef stock, and even beer. Corned beef is most known to be served in dishes like Reuben sandwiches, corned beef and cabbage, and with potato hash. Most corned beef briskets come packaged with a bag of seasoning spices already in it. That is absolutely fine to use it if you wish but I like to mix my own. Seasoning packet doesn’t usually have a few ingredients that I like to add for more flavor and aroma. I add this mix to the broth that corned beef is cooking in and the flavor can’t be beat. Aroma is amazing from the minute it starts to cook. Number one tip that I have to making corned beef is not to add salt! Corned beef is cured in a very salty brine so it is already quite salty. This salt transfers into the broth while cooking so the dish will be salty enough. I even rinse out the brisket when taking it out of the package to wash off some excess salt. IF you absolutely do not like a lot of salty flavor, you can choose to do an extra step and quickly bring brisket to boil in a pot of water. This will take extra salt out. To do that, place brisket in a pot of water and bring it to boil. As soon as it starts to boil, take the brisket out. You can opt for cooking corned beef with or without addition of beer. If you want to add beer, replace 1 cup of broth with 1 cup of beer. Some people like to add Guinness but personally, I find that it adds bitterness to the brisket. If you are not a fan of bitter beer, choose an Ale. 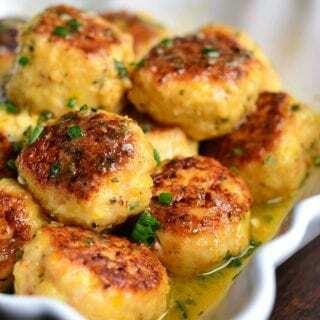 Killian’s is a good addition in this recipe. UPDATE: I’ve gotten an few questions about making this recipe in a slow cooker and I’m happy to say that it is absolutely possible and very easy. To make this corned beef brisket in a slow cooker, spread cut onion and garlic cloves in the bottom of a Crock Pot (or any other slow cooker). Place flat cut brisket on top of the onions, fat cap up, and add seasoning mix. Close the lid and let it slow cook on low for 6-8 hours. Note: brisket is a tougher cut of meat to it’s best if it’s cooked on low for longer period of time. The most common way to serve corned beef is in Corned Beef and Cabbage dish. You can cook veggies in the same broth that brisket was cooked in, after brisket is fully cooked and take out of the pot. This corned beef brisket can actually be served with any side dish. 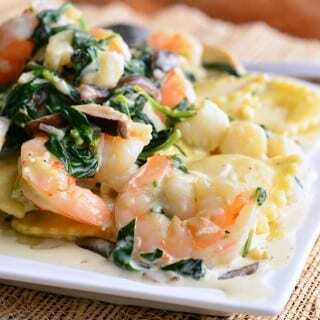 You can easily serve it with mashed, roasted potatoes, and any roasted veggies. Slice brisket against the grain, into thin slices and use it in sandwiches. Reuben sandwich is a great traditional way to use corned beef. Try this corned beef in a sandwich with fried onions and horseradish sauce. This sandwich recipe will give you the recipe to make fried onions and horseradish sauce. 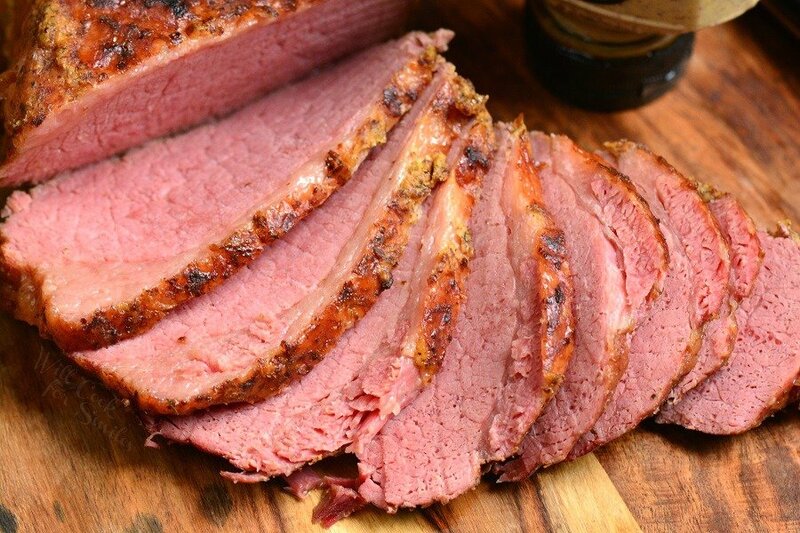 Soft, juicy, and tender corned beef brisket made in an Instant Pot. Quarter onion and spread it in an instant pot. Add garlic cloves and seasoning mix. Place brisket on top of onions, fat cap up. Close the lid of the Instant Pot and make sure it's latched. Make sure to turn the valve to "seal." Set Instant Pot to pressure cook on "stew/meat" setting for 75 minutes. 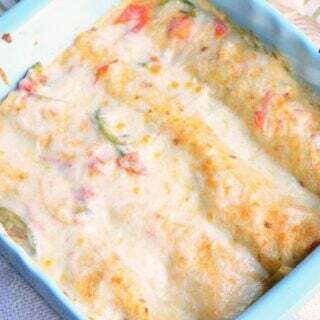 It will take a few minutes to heat up and then start cooking. Once time is up, let it naturally release for 20 minutes. After that, you can carefully turn the valve and do a fast release to let remaining pressure out. 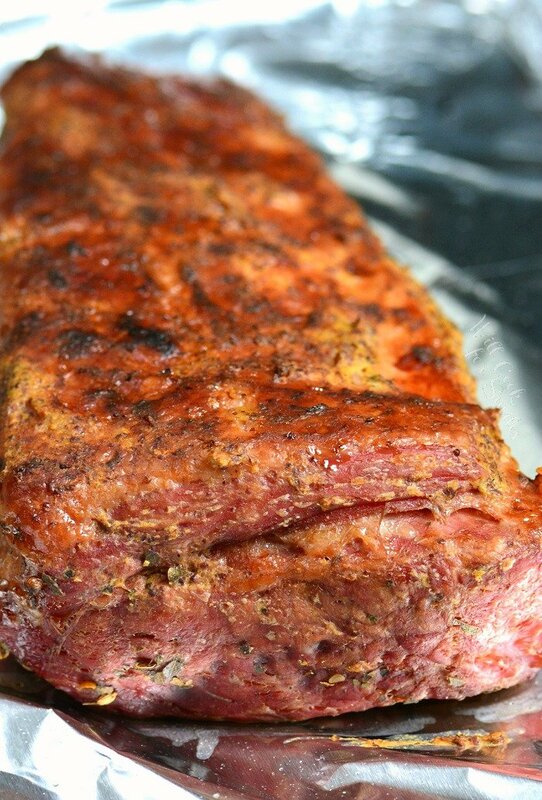 Take brisket out and place it on the baking sheet lined with aluminum foil, fat cap up. Set oven to high broil setting and set the rack in the middle of the oven. Rub top and sides of the brisket with spicy mustard. 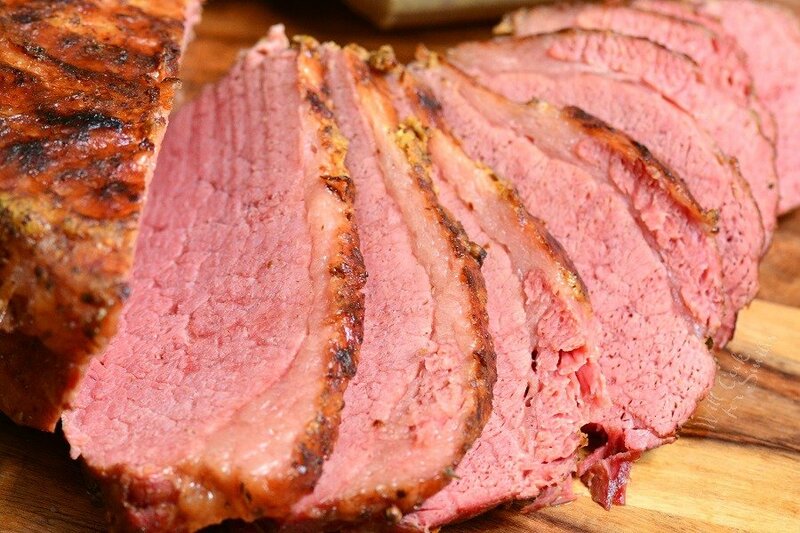 Take corned beef brisket out and make sure to slice the meat against the grain! Luckily, with the corned beef brisket, it's very easy to see the grain, you can look on the bottom since there is a fat cap on top. NOTE: Nutritional value is calculated for the whole recipe, not just for corned beef brisket. Does this recipe transfer well to a slow-cooker? Absolutely! You can set it up in a slow cooker the same way and I would recommend cooking in on low for 6-8 hours. You can brown the top under the broiler after it’s been cooked. Everything you ascribe to is delicious. Which cut of brisket is best, flat or point? 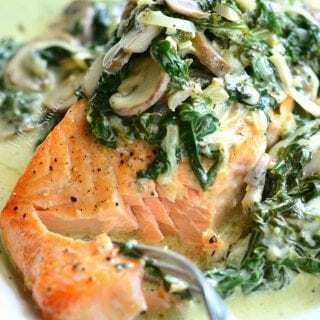 Can this recipe be cooked on the stove top in large pot for severla hours? I read your recipe for baked Corned beef but there are no spices. Yes, in the recipe for the baked one, I was trying to change the flavor pallet of the whole brisket and cooked it with mustard and sugar. In this recipe, I was keeping the flavor pallet that’s more of a “corned beef and cabbage” kind of dish. You can cook it on stovetop but I’m not sure how the texture will turn out.. The reason why it’s best to cook it in a slow cooker, or pressure cooker, or over is because the heat surrounds the brisket evenly and cooks it all around uniformly. Is stovetop your only choice or do you have a slow cooker? Now that I have an Instant Pot, I’m So excited to try this on St. Patrick’s Day. This year I will follow your instructions, and I am confident that dinner will be perfect! For the vegetables, cook this corned beef per recipe, and then take it out of the instant pot and add the veggies right into the liquid the beef was cooked in. Close the instant pot lid and seal the valve. Cook veggies in instant pot on high pressure for about 5 minutes. (Cut potatoes into quarters first.) 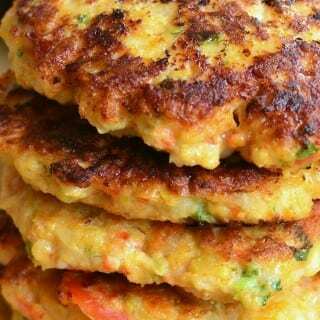 Do a quick release after the veggies have been cooked. I’m going to try your recipe for the corned beef this week. My corned beef is about 5.3lbs. Should I cook it for 90 minutes in the insta-pot instead of 70 minutes? Thanks for offering up a beer free option and for breaking down what spices to use (most say to use a “spice packet”). Will try this on this week! FYI, made it today. Used a 3-lb, cut in half to fit and adjusted time to 60 min w 10 natural release and it turned out great! 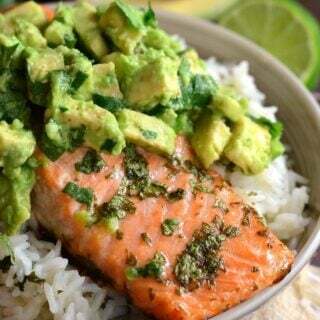 I used your spice mix too! Thanks! I’m so happy to hear that! Thank you so much for coming back and telling me, Craig!